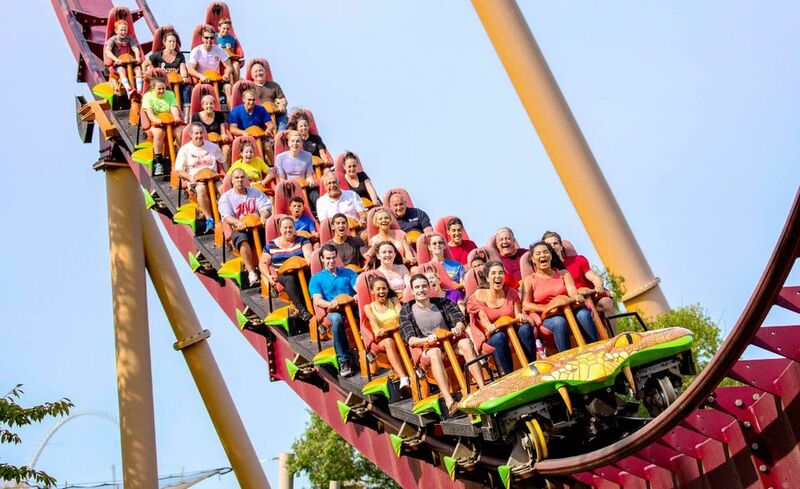 Will you be heading to Kings Island? Are you wondering which rides merit your attention? It's subjective of course, but the rides listed here are, arguably, the best that the Ohio amusement park offers. Known for its roller coasters, it's no surprise they dominate the list. You may have younger children who wouldn't meet the height requirements for the major coasters, in which case you'll probably want to head to Planet Snoopy. If it's a crazy hot day, Soak City water park offers cool relief and fun water slides. If thrill rides just aren't your thing, you might want to check out some of the tamer rides, shows, and other things to do at the park. (Although, what the heck are you doing at Kings Island if you don't love thrill rides?) Even if you do love thrill rides, the park offers non-coaster screamers, such as Drop Tower and Delirium. But, by and large, the park's off-the-shelf thrill rides, water park attractions, and other things to do aren't all that unique. Let's face it: The coasters are front and center, and those are the marquee rides that bring visitors to Kings Island. The following ones are the best of the best. If you only have a limited amount of time to spend at the park, these are the coasters that should be on your to-ride list. The soaring hypercoaster is the crowning achievement at Kings Island. Slithering smooth and positively loaded with airtime, Diamondback is an exhilarating experience from start to finish. It is not just the best that the park has to offer; it is among the best coasters anywhere. Opened in 2014 on the site where the notorious Son of Beast coaster used to brutalize riders, Banshee offers a much more pleasant ride on its rails (although it is still loaded with the "good" kind of thrills). At the time it opened, it laid claim to the title of the ​world's longest inverted coaster. At 4124 feet, the ride offers 2:40 of joy. The modern-day woodie doesn't break any records, but at 53 mph, Mystic Timbers revs up and delivers some great thrills. Before it opened, the park teased fans with the tagline, "What's in the shed?" Now that it's open, and the post-ride mystery has been revealed to be a fairly lame special effect, it still doesn't take away the fact that the coaster is a solid ride. One of the most celebrated rides in the world, The Beast has lots of fans. It also has a fair amount of detractors. That's why it is among the top 10 most overrated roller coasters. It holds records and has many features that are captivating. But it can also be surprisingly dull. For wooden coasters, consider The Racer. The classic racing woodie (it has two side-by-side tracks on which two trains "race" one another) generally offers decent airtime. It is famous for having been prominently featured on an episode of the 1960s TV show The Brady Bunch when the blended family visited the park. It is an indoor coaster, but don't ride it expecting Space Mountain-like theme or effects. It's really more of a high-speed coaster with inversions in the dark. It does feature a pretty wild 54-mph launch into the void. An early version of a flying coaster, passengers have to go through a convoluted loading process that involves multiple restraints and motorized reclining seats. The brutally slow load often makes the lines and wait times long. Later flying coasters, such as Manta at SeaWorld Orlando, have a quicker loading process and offer better rides. Still, Firehawk is fun. A holdover from the days when Kings Island was part of the Paramount Parks chain, the coaster used to be themed to the film, The Italian Job. The effects don't always work as originally intended, but the ride is still fun. Among its interesting features is a helix that sends the cars ascending the track, rather than descending. This isn't a coaster, obviously. And it's not even inside Kings Island. But if you will be visiting the park and will be needing accommodations, the adjacent Great Wolf Lodge is both convenient and a wonderful resort. It features a great indoor water park.